Product #15942 | SKU LN2MIC-ZOOMH6 | 0.0 (no ratings yet) Thanks for your rating! The Sescom 3.5mm line-out to camera mic-in -25 dB audio cable is 23 cm long and is for the Zoom H6 recorder. It is designed to connect the line output of the Zoom H6 recorder to the mic inputs of compatible Canon and Nikon DSLR cameras. 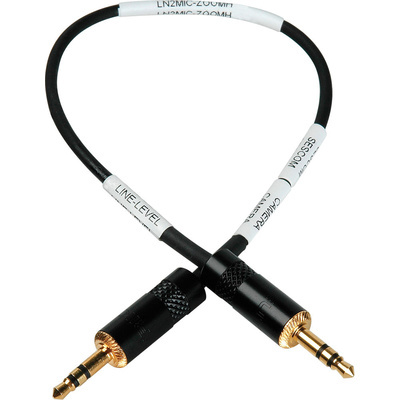 The cable features 3.5mm TRS connectors on both ends. It also features a -25 dB attenuation pad on the mic input end of the cable. When using with the H6 recorder it steps down line-level audio to mic-level audio and matches levels to DSLR cameras.